I shake John Carney and then Christine Carney’s hands. “Happy New Year and welcome aboard Airship Steamed. Watch your step,” I call as I stretch my short legs in a leap across the wide gap between the dock and the airship. John and Christine, the owners of Thick and Thin Designs, follow me into the parlor. “How can you not love any business inspired by the vision of a zombie horde on cupcakes.” The dainty china cups cease rattling on the tea table as our airship glides smoothly pass the clouds. “Several of your Thick & Thin creations have a Steampunk appeal: gears, mustaches, tentacles and hot air balloons. Do you have an interest in Steampunk?” I pick up the teapot and pour my guests a cup of Earl Grey. John and Chrisitne pick up their teacups. “We love the Steampunk genre! We love the combination of beautiful clothing, dirty industrialization and the whimsical nature that threads through it all. Steampunk and those who love it are always an inspiration for us when we’re creating new designs because we know that there are great number of people out there who love it and not many products to support it.” Tendrils of steam rise from their teacups as they each take a sip. I pour myself a cup of tea. “How do you get your inspiration for your creations?” Lifting and tilting my teacup to my lips, I take a long sip. John reaches for the sugar bowl, picks up a white cube and plunks it into his tea. “We’ve always been fans of the obscure, geeky and cute so we often find inspiration in our hobbies. When we’re deciding what to put on our shop we think of things that we would want and can’t find anywhere else. We have a very diverse group of friends, sometimes thinking about what they might want can lead to innovative designs that we wouldn’t necessarily think of for ourselves. The tentacles for instance were created specifically for one of our Cthulhu loving friends who had just moved to the US from Spain. Obviously they had to be shared with the world, and now they are one of our top sellers.” He dips a silver teaspoon into his cup and swishes it gently from side to side. The airship steamed has landed and John and Christine Carney must get started on making cupcake toppers for all the parties in 2014, but they left their left calling cards for us. Maeve Alpin, who also writes as Cornelia Amiri, is the author of 19 published books. Her latest Steampunk/Romance is Conquistadors In Outer Space. She lives in Houston Texas with her son, granddaughter, and her cat, Severus. This weekend was the annual ball at the Riverside Dickens’ Festival. As usual the hubby and I dressed up and had an amazing time. When I finally manage to get the pictures off the camera I will blog about it. However, right now I’m just too tried. I’m to tired to come up with anything coherent. So, when all else fails, fill the silence with cupcakes. Many of you know I’ve been on a quest for Absinthe cupcakes, because when Innocent Darkness *finally* comes out, I want to have a big party, and what better to serve at a steampunk book release party than Absinthe cupcakes? 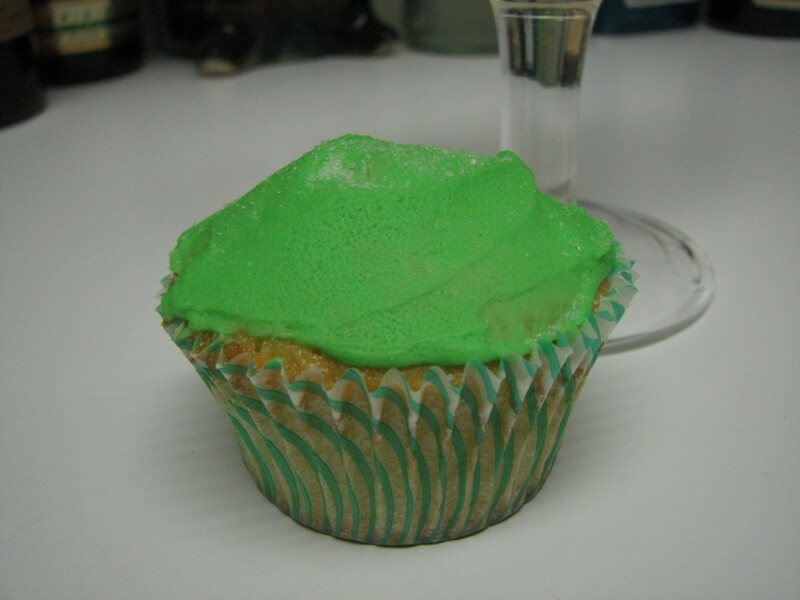 But no one — not one person — has sent me recipes for Absinthe cupcakes. So, I decided to Google it. As it turns out, there are recipes. Now I just have to a) make them to see if I like them or b) find someone to make them for me. Coconut and Lime has a recipe with Absinthe in the batter and frosting (notice a theme here?) and garnishes them with sugar cubes, which is very cute, methinks. Sara’s Vegan Kitchen of Wonder and Discovery did a Vegan version. Some of the best cupcakes I’ve ever had have been Vegan. I also liked how she blogged about her trials and tribulations. I always find that helpful. 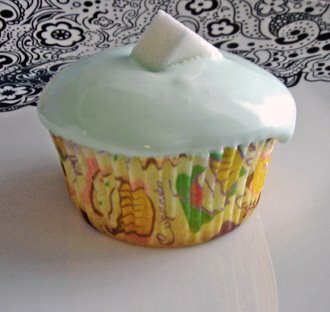 Maybe it can be a challenge on Cupcake Wars? Can they have little fondant (or marzipan) gears on them? Please?